Do you use LinkTech products? Submit a photo and a brief description of how you are using any of their products for a chance to win! Every participant will be entered for the chance to win a $250 GIFT CARD. Entries must be submitted via email (marketing@ltcouplings.com) and LinkTech's top favorites will be posted on their social media sites. THE DEADLINE IS QUICKLY APPROACHING: December 1st, 2015. A panel of judges will select 4 winning photos who will each receive a $250 gift card just in time for the holidays. Teledyne DALSA, in partnership with FPE Automation, invites you to attend a special, high-quality and information-rich vision event where you will learn about the latest industry products and gain real experience working with Teledyne DALSA systems. Download/view the invitation in PDF format. (82 kb). Following the session, we'll host a special Q&A session to answer any questions about your actual application. Bring in an example from your work environment, and our experts will be there to assist you. Attention - Missouri Area Customers. It's Your Turn to Mark It/Read It! and we'd like to invite you! An event as fun as it is informative! Spend the day immersed in live demos and informative sessions with the experts. Featuring Cognex handheld and fixed mount readers and Panasonic laser markers. Enjoy free giveaways and a delicious lunch. We’ll be skipping the easy targets and jumping right in to the issues our clients tell us they are facing today. Poor focus, low contrast, washed out originals. Items that are difficult to mark. Finder degradation and background problems. They all result in process bottlenecks. We’ll show you how you can eliminate those with the right tools. You’ll find more information about that here. That’s not all. We’ll follow it up with a hands-on session; application Q&A. Bring in examples of what you’d like marked and read. Panasonic’s specialists will take them back to their laser marking lab and prepare you a custom, comprehensive report. Download/view Mark it. Read it. Event flyer in PDF format (82 kb). 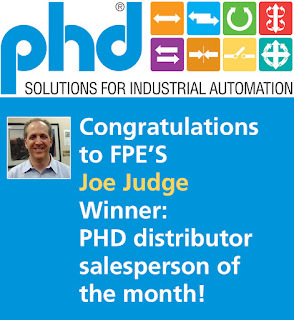 Congratulations to FPE Automation's Joe Judge - PHD Distributor Salesperson of the Month! 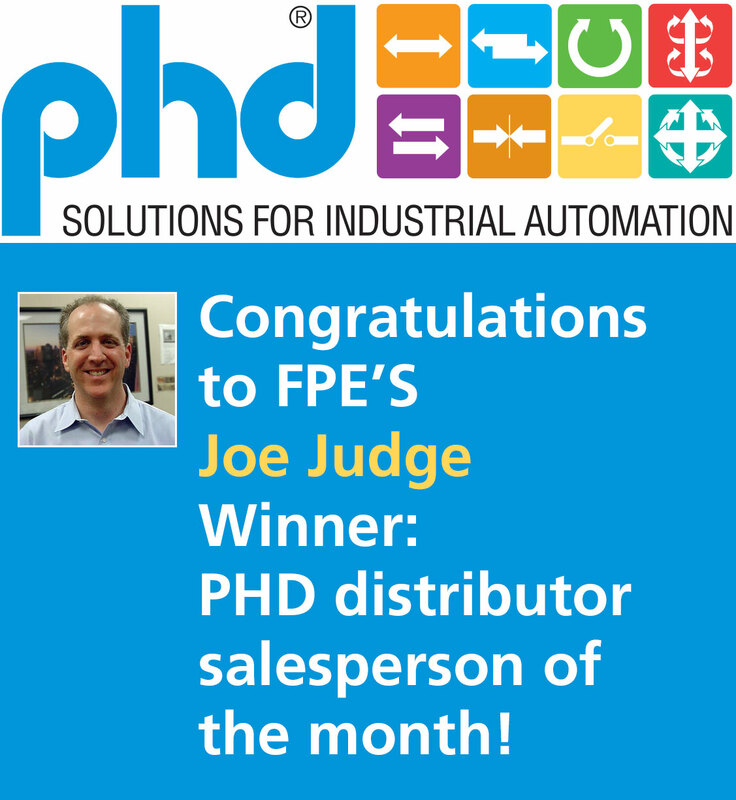 From PHD: The October 2015 Distributor Salesperson of the Month goes to Joe Judge of FPE Automation!!! Here's why this is more than just an award - Joe received this honor (FPE Automation's second this year) for his efforts at a multi-national company that builds conveying and material handling systems on an OEM basis. Joe was able to provide more reliable, higher quality ...solutions that made sense. The solutions involved rotary actuators, slides and clamps. The company is more confident in the PHD products. They like PHD's online tools (CAD and configurator). They're also much happier with the delivery times. In other words, when we win an award like this one, it means that we offered a very discerning customer a solution that they made the decision to implement. We think that says it all. FPE Automation and PHD can do the same for you. FPE Automation would like to thank the brave individuals who have served our country and maintained our precious freedom. 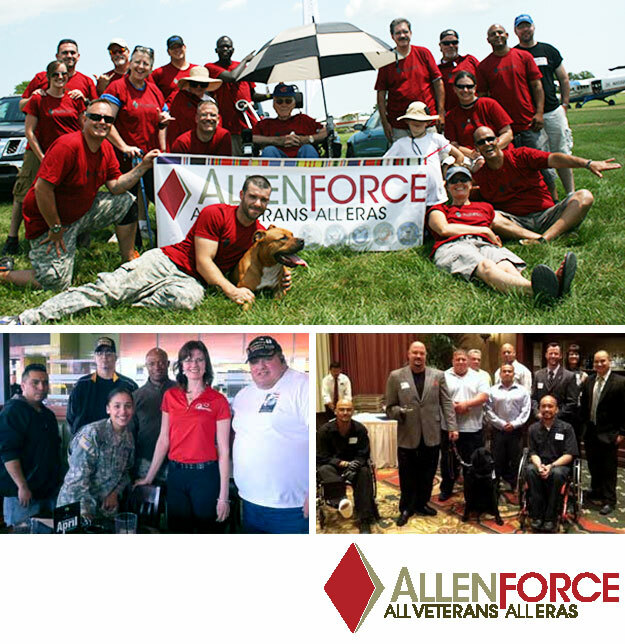 FPE is a proud supporter of AllenForce, is a not-for-profit organization that serves all veterans from all eras. A blog is a place for words. Age 25. Son, brother, nephew, friend, co-worker. Click here to view the formal announcement. If you wish, you can add your condolences to the ones we have put there.